Transform your food scraps—cooked and uncooked—into a beneficial addition to your garden. 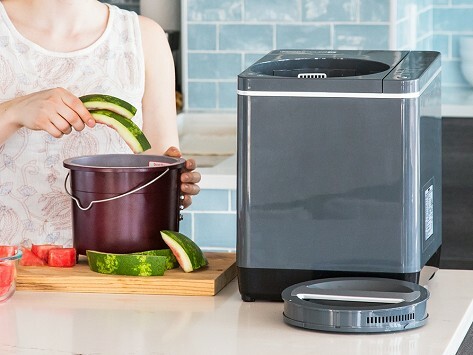 This food recycler takes just three hours to dehydrate them and reduce the volume by about 90%. And it does it neatly, with heat and vibration that uses little energy and leaves no odor. Add it to your soil outside, and with some water and time for the byproduct (your incredibly shrunken leftovers) to decompose, it’ll release micro-nutrients that help plants grow. Dimensions: 13" x 12" x 11"
Quiet, odorless and efficient at turning food waste into compost! Handles fruit pits and rinds well. Glad I purchased this item. So pleased with this purchase! This energy-efficient food recycler will transform your kitchen scraps into a beneficial mixture for your yard—fast. Toss any unwanted food, cooked and uncooked, right on in—peels, cores, veggies, and even bones, shells, and meat. 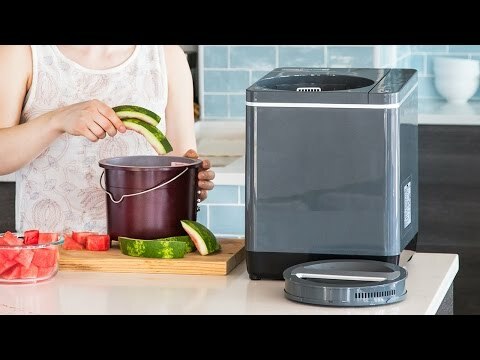 Food Cycler dehydrates and sterilizes food waste with heat and vibration, reducing the volume by 90% in less than three hours. Thanks to a carbon filter, the process is odorless. Your amazingly shrunken scraps can go straight to your garden or lawn. It’s prime landscaping material, too. Once it’s watered and begins to decompose, it’ll release micro-nutrients like phosphorous, potassium, and nitrogen that help plants grow. Unlike traditional composting, Food Cycler takes hours (not months) to get your food waste away from landfills and in your yard.